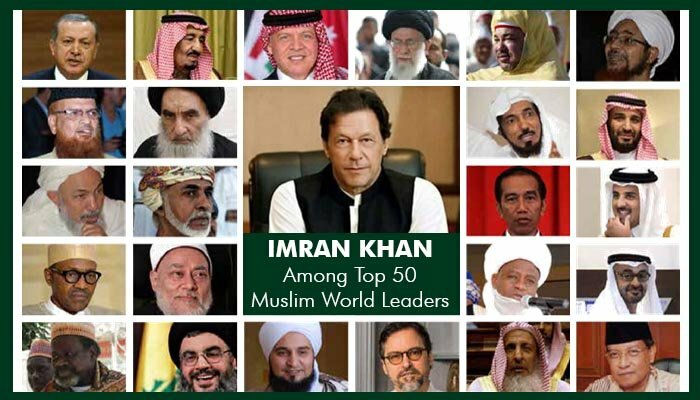 KARACHI: Pakistan Prime Minister Imran Khan has been included in the Top 50 of World’s Most Influential Muslims list of 2019. PM Imran has bagged the 29th prestigious spot in the coveted list. The list, ‘World's 500 Most Influential Muslims’ is prepared annually by the Jordan-based Royal Islamic Strategic Studies Centre. Turkish President Recep Tayyip Erdoğan is ranked first place on the list, while Saudi King Salman bin Abdul-Aziz Al-Saud was ranked second in being the most influential Muslim, while Jordanian King Abdullah II Ibn Al-Hussein was ranked third. The book has been published annually by The Royal Islamic Strategic Studies Centre in Jordan's capital Amman since 2009, and its 10th edition for the year 2019 was published this month. It sets out to ascertain the influence some Muslims have on the Ummah (worldwide Muslim community), or on behalf of the Ummah, according to the book. "Influence is: Leader of 210 million Muslims in Pakistan and major influence on the Pakistani diaspora," it explains. Along with Imran Khan, there are three more Pakistanis on the influential list. Justice Sheikh Muhammad Taqi Usmani (6); Haji Muhammad Abdul-Wahhab, Amir of Tablighi Jamaat (14); and Maulana Tariq Jameel, Scholar and Preacher (40). In August 2018 Imran Khan was sworn in as the 22nd Prime Minister of Pakistan. It had been a long journey. A Long Journey: When the Pakistan Tehreek-e-Insaf (PTI) party won the 2018 General Elections, it was the culmination of a 22-year journey for Imran Khan. He had founded the PTI in 1996 hoping to oust the ‘political mafias’ ruling Pakistan. He garnered national support over the next two decades and in 2013 had become the second largest in the country by popular vote, before eventually winning in 2018. Challenges: A crackdown on corruption and bringing accountability to the forefront are his major pledges. He has already implemented cut-backs in extravagant government expenditure and is using his personal credibility to fundraise for a dam. Pedigree: Imran Khan started fund-raising for a cancer hospital soon after his mother died from cancer. His appeal within Pakistan and to the dias-pora Pakistani community raised enough funds to open the Shaukat Khanum Memorial Cancer Hospital and Research Centre in 1994, in Lahore. It is a hugely successful project with 75% of patients receiving free treatment. He also spearheaded a successful project to build Nama University, which provides scholarship assistance to over 90% of its students. A Sporting Legend: Imran Khan played professional cricket for 22 years and is recognised as one of the game’s finest all-rounders. His ability to lead and unite an often disparate team, culminated in Pakistan winning the 1992 world cup. It is this ability and success that many hope can be replicated in the political field. Personal Life: His three marriages have all attracted considerable media attention. The first to Jemima Goldsmith, the second to Reham Khan, and the third to his current wife Bushra Maneka.